Meet Hank, Mack, and Poppy, the little monster crew in Little Monsters Guide to Learning Computers, iPads and Phones by Kate Marshall. They have got new gadgets and are trying to figure out how to use them. There are rules they need to follow, and things they need to know. Hank wants to use the iPad and wants to play right now. Mack is annoyed with the computer and is handling it roughly. He does not realize that the computer will not last for long if he is not gentle with it. Poppy wants to take the iPad to the tub, but computers should always be kept away from water. Let us read on and see how these little monsters are taught to handle the gadgets like pros. 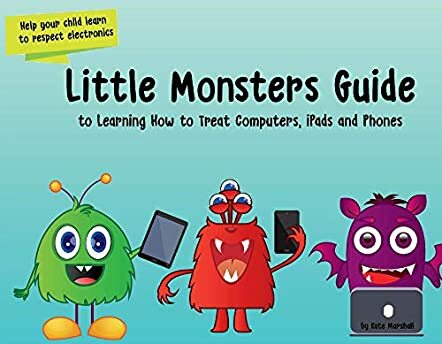 The author’s approach to the topic is fun and interactive, and in case young readers have any doubts about handling gadgets, they can ask the little monsters what to do. The illustrations are fun and colorful and will help youngsters understand how to take care of and handle the gadgets without spoiling them. It is a good book for parents, tutors, and educators to help children understand how to use and take care of their gadgets through Hank, Mack, and Poppy. Books like this are good for children to make information interesting and education fun. In case you have any questions regarding how to handle the gadgets, ask Hank, Mack, and Poppy, and they will surely help you out.